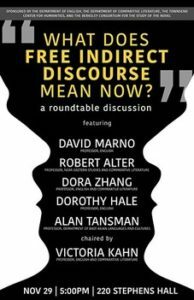 What Does Free Indirect Discourse Mean Now? Roundtable participants are UCB faculty Robert Alter (Near Eastern Studies and Comparative Literature), Dorothy Hale (English), David Marno (English), Alan Tansman (East Asian Languages and Culture), and Dora Zhang (Comparative Literature and English). Moderator: Victoria Kahn (Comparative Literature and English). Alan Tansman is a member and former co-chair of the Representations editorial board. In addition to contributing several essays to the journal, Victoria Kahn has also edited two special issues for us: Early Modern Secularism (Winter 2009, no. 105) and Mimesis East and West (Spring 2006, no. 94). 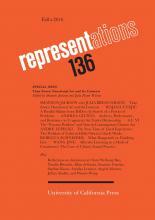 Dora Zhang‘s “A Lens for an Eye: Photography and Proust” was published in Representations 118 (Spring 2012). Let me hoist up an epigraph, which I mean to wave brightly over everything I shall go on to say, from Ludwig Wittgenstein (no surprise, to anyone familiar with my writing): “The light shed by work is a beautiful light, but it only shines with real beauty if it is illuminated by yet another light.” Let me repeat it, the thought is so foreign to our usual assumptions: “The light shed by work is a beautiful light, but it only shines with real beauty if it is illuminated by yet another light.” I will proceed by making several somewhat general points, which I will try to back up with examples mainly from my own work. 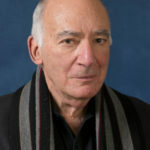 MICHAEL FRIED is J. R. Herbert Boone Emeritus Professor of Humanities and the History of Art at the Johns Hopkins University. A new book of poems, Promesse du Bonheur, with photographs by James Welling, has just been published by David Zwirner Books. 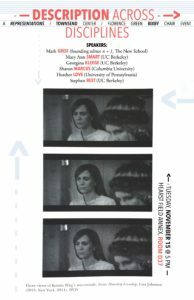 Featuring speakers Mark Greif (founding editor n + 1, The New School), Mary Ann Smart (UC Berkeley), Georgina Kleege (UC Berkeley), Sharon Marcus (Columbia University), Heather Love (University of Pennsylvania), and Stephen Best (UC Berkeley). Read the introduction to the special issue, “Building a Better Description,” here. Sponsored by Representations, the Townsend Center for the Humanities, and the Florence Green Bixby Chair in English, UC Berkeley.